Matthew Jackson began his journey to the center of the Earth on lonely gravel roads in Montana. Uninterested in motorcycles and horses, and miles from neighbors and friends, Jackson roamed on his family’s 6,000-acre cattle ranch an hour north of Yellowstone Park and flanked by the Rocky Mountains. His eyes hunted for agates and petrified wood fragments, and he filled so many cardboard boxes with specimens that his mother occasionally asked him to empty some before collecting more. As he matured, Jackson’s appreciation for rocks moved beyond aesthetics. “I wanted to know how they formed. I wanted to know their stories,” said Jackson, now 30. Jackson carried his passion for rocks to Yale University, where he studied geology, and then to the Woods Hole Oceanographic Institution, where he arrived in 2000 as a summer student fellow to work with geochemist Stan Hart. He appeared before Hart at an auspicious time. Hart had recently returned from Samoa, a remote island chain in the South Pacific, where he and colleagues had discovered and mapped a massive, 14,300-foot-tall underwater volcano that resembled Mount Rainier in Washington. In a sense, the submerged volcano, called Vailulu’u, is a yet-to-be-born island. 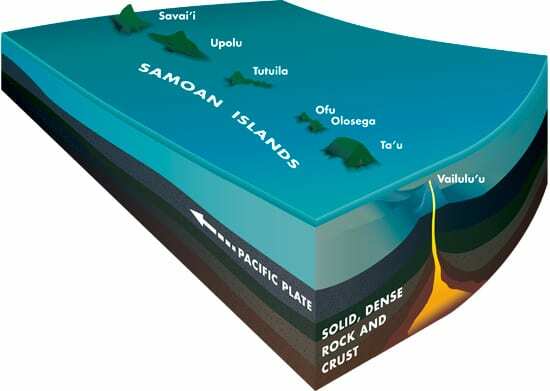 In time, built by layers of magma bursting through seafloor crust, it will poke above the ocean’s surface and become a seventh Samoan island. 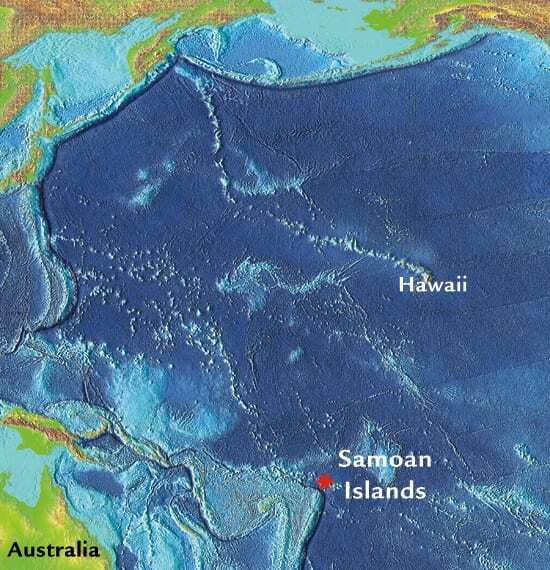 The Samoan islands, like Hawaii’s islands, are formed from plumes of hot, buoyant magma that rises from deep within Earth’s interior and melt beneath the island chain. Hart and colleagues were eager to learn more about the similarities and differences in the origins of the island chains. Hart looped Jackson into the project, plunging him into a five-and-a-half-year graduate research project that partially concluded this Halloween, when he defended his Ph.D. thesis. During his defense, Jackson displayed an image of the inside of the Earth, complete with cross-section of the crust, mantle (which reaches 2,900 kilometers down, equivalent to the distance between Los Angeles and Chicago), and core. He compared these deep reaches of Earth to a new frontier. Instead of shovels, Jackson uses seismometers to see what’s happening beneath Earth’s surface. These instruments record subtle ground-shaking movements caused by earthquake-generated seismic waves that travel along Earth’s surface and through its interior. By analyzing these waves, scientists can infer a great deal about the characteristics of the rocks the waves are traveling through. They can tease out the structure and composition of the mantle and the long plume rising from it to the surface, which help reveal hidden geological processes that have created some of the ocean islands that dot the face of our planet. Marine geologists have ocean-bottom seismometers that monitor seismic activity beneath the seafloor. But these instruments are expensive, and require costly research vessels to deploy. Jackson, working on a shoestring budget, borrowed four seismometers, corralled colleagues including his co-advisor John Collins, hired some extra help, and put seismometers on four islands himself. Once he finally installed the instruments, he had to wait—for two years. While the sensitive seismometers record earthquakes from all over the globe, Jackson is interested in seismic waves only from very big—and very rare—earthquakes that come from places thousands of kilometers away, like Alaska and Chile. They also need seismic waves coming in from the right angle. “Many nearby earthquakes shake up the area, but they don’t do us any good,” he said. Those waves cut shallowly and more horizontally through the mantle and plume, he said. 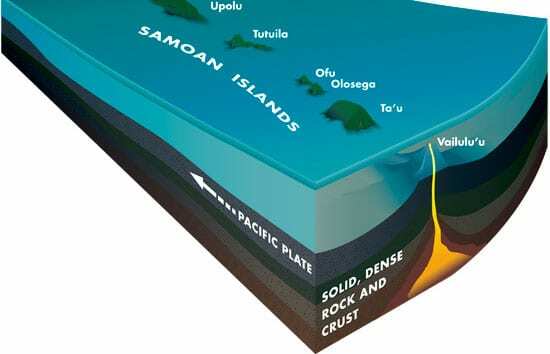 “We need distant quakes that send waves into the Earth.” For his research needs, they must re-emerge beneath Samoa at an angle nearly perpendicular to the oceanic plate that underlies the seafloor. Jackson returned to Samoa more than a year ago to download the data and make sure his instruments worked (they did). But he doesn’t know what has happened since, or even if his instruments have been working. Two weeks after defending his Ph.D. thesis, Jackson headed for Samoa to download data from his seismometers. He will return to WHOI as a postdoctoral scholar to sort through the data and begin to form a picture of the magmatic plumbing system that created Samoa. Funding was provided by the National Science Foundation, the Ocean Ventures Fund, and the Academic Programs Office, Deep Ocean Exploration Institute, and Coastal Ocean Institute at WHOI. Noble gas measurements at WHOI were supported by a National Science Foundation grant to WHOI senior scientist Mark D. Kurz. Jackson acknowledges the help of his co- advisor, John Collins, as well invaluable field assistance from Bob (“Dengue”) Greschke. The project was possible with the generous help from the Samoan government and a multitude of Samoan friends (the Malae family) and colleagues (Shaun Williams and company). The support of IRIS-PASCAL is greatly appreciated. Our work is not possible without you.